An idiom is a set expression which refers only to one particular language. Idioms are similar to proverbs but unlike proverbs, they are not complete sentences. For example, Russian idioms cannot be translated into another language. Therefore, when we need to use idioms, we try to find their English equivalents. “Вот где собака зарыта!” The English equivalent: “That’s where the shoe pinches”. Meaning: That’s the thing, that’s the real reason. The idiom appeared after the story about an Austrian soldier who came through the war with his beloved dog. Once during his travel, the dog saved his life. When the dog died, the grateful soldier buried his companion, and erected a monument, which existed for more than 200 years. Later, tourists found the monument for this dog. Then, there appeared this idiom which means “I found what I was looking for”. However, there are other versions of its origin. “Зарубить себе на носу” The English equivalent: “Bear it in mind”. Meaning: To remember once and forever. 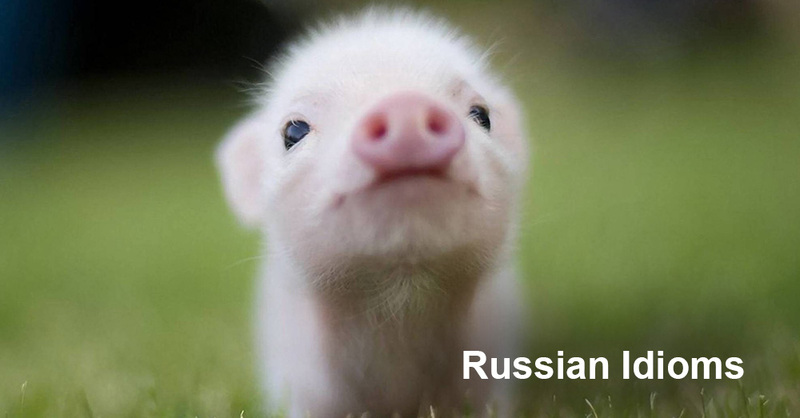 The word “нос” ( a nose) in this idiom does not mean a part of human’s body. The word “нос ” means “a small wooden plank for taking notes”. The idiom appeared in ancient times, when illiterate people had to carry wooden planks to take notes. These planks were called “носы” (noses). “Лезть на рожон” The English equivalent: “To ask for trouble”. Meaning: To do something dangerous, to run into trouble. The idiom originated among bear hunters, when they used ” рожон ” which is a pointed pole. When hunting for a bear, they put this pole forward, an enraged animal attacked the pointed pole (“рожон”) and died. “У черта на куличках” The English equivalent: “In the middle of nowhere”. Meaning: To be very far away in an unknown place. The word “куличики” entered the Russian language as a mispronounced Finnish word “кулижки” which means small bogs or forest glades. In this woodland, settlers had to cut “кулижки” or grounds where they could plough and mow. Farmers very often had to go really deep into the woods to get to their “кулижки”, where, as legends had it, devils and other evil spirits lived. This is how this idiom, which Russian people often use, originated. “Ударить в грязь лицом” The English equivalent: “have egg on one’s face”. Meaning: to embarrass oneself, to feel humiliated. Originally this idiom meant “to fall to the dirty ground”. In the past, during fist-fighting this kind of fall considered to be extremely disgraceful. A weak opponent was thrown to the ground. This is how this expression originated. “Подложить свинью” The English equivalent: “play a dirty trick”. Meaning: Secretly to plot something bad, to spite. According to many sources, this idiom emerged from the fact that some people do not eat pork because of their religious beliefs. If this person was given pork for his meal and he did not know about it, his religious belief was bespit. These are just e few Russian idioms which are popular with Russian speakers. Besides that, they have equivalents in the English language.